This course allows you to listen in on the recorded coaching demos on the Leadership Coaching Live! 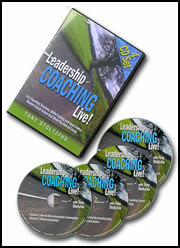 audio CD set from the Coach22.com coaching bookstore. This 4-disc set with four hours of audio is a companion to the book, Leadership Coaching by master coach Tony Stoltzfus, and includes demos of the key techniques in the book. Tony demonstrates how to turn “want to” into “will do” with the coaching techniques for developing powerful action steps with high buy-in. We created this course especially for our international customers, so you can enjoy this great coaching resource without paying for international shipping for the physical discs.